Milwaukee, like many cities in the United States, grew rapidly throughout the nineteenth century. Civic attention was generally focused on how to accommodate industry and manufacturing. The competition over urban space resulted in high concentrations of industry, followed by densely populated neighborhoods of workers and their families. Parks were not seen as a valuable use of land. Some of the earliest parks that were built surfaced in the shadow of Milwaukee’s great breweries: huge brick and mortar structures found atop the bluffs of the Menomonee Valley, and along the rivers that ran to Lake Michigan. Large numbers of German immigrants began arriving in Milwaukee in the 1840s and 1850s. Within a few years Schlitz, Pabst, Blatz, and Miller breweries, among others, were established. As powerful industrial enterprises, these breweries occupied large amounts of urban space and required the labor of thousands of early Milwaukeeans. Making beer, quite appropriately, was the primary goal of breweries. But a related project emerged that responded to the desires of the many industrial laborers who spent hours crafting a product that would become synonymous with Milwaukee. Amid the crowds and smoke of this newly industrializing city, several breweries began constructing grounds—gardens—for the workers and their families. Schlitz and Pabst parks as well as Miller’s Gardens and Lueddemann’s-on-the-Lake arose during this period to serve Milwaukee’s thirsty, leisure-seeking citizens. The original intent of the gardens was to provide a place for respite, music, and camaraderie amidst the industrial reality that was the nineteenth-century American city. The beer garden was a place for afternoon concerts, merry-go-rounds, and outdoor theater. These gardens, though private in the beginning, provided the opportunity in later years for a public park system. As industrial and residential growth continued, early beer gardens acted as “place holders,” keeping at bay the appetite of industry and development that overrode much of the rest of Milwaukee. It was not until several years later, as a nationwide park movement gained momentum that Milwaukee embarked on several large-scale park projects that would influence the city to the present day. Approaching the twentieth century, parks were increasingly seen as important to the civic, moral, and aesthetic evolution of cities throughout the United States. Additionally, they were viewed as a prescriptive response to the ill effects brought on by increased neighborhood density and industrial development. Leading the national call for greater park space was the most noted figure in the development of New York’s Central Park, Frederick Law Olmsted. Considering Olmsted’s prominence, Milwaukee’s leaders felt fortunate that Olmsted would have some availability to consult with the city while he worked in Chicago on the World’s Columbian Exposition of 1893. In the late nineteenth century, local civic leaders began expressing concern about the lack of a great park and the overall difficulty citizens had in accessing Lake Michigan in particular. One of the early beer gardens such as Lueddemann’s-on-the-Lake presented the opportunity to address these shortcomings. At this time, Christian Wahl, president of the parks commission sought to utilize the Lueddemann’s location while seeking out the guidance of Frederick Law Olmsted and his design firm. Driving this new approach was the underlying shift in appreciation for natural spaces throughout the country. Expanding cities had made accessing “the country” increasingly difficult. It was time to construct an alternate form of nature within reach of Milwaukee’s citizens. ravines add greatly to the natural beauty of the landscape, and not only necessitate bridges, but make them possible; for in many cities which, like Chicago, lie absolutely flat, the landscape gardener has been obliged to first make a ravine in order to have some excuse for a bridge. Influenced by the design aesthetic of Olmsted and his firm, Milwaukee’s Lake Park took the form seen in most Olmsted landscapes: ornate bridges, fountains, and paths amidst pastoral fields, ravines, and stands of woods. 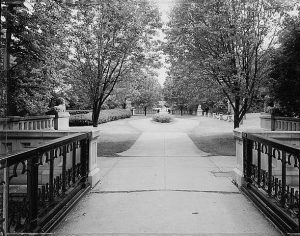 Though Lake and two other Olmsted-designed parks (Riverside and Washington) have stood the test of time in Milwaukee, the response to such landscapes was to develop a peripheral system of parks and parkways in the next few decades. Milwaukee’s Park system blossomed under the influence of Charles Whitnall and his master plan of 1923. Growing up on a grassy knoll west of the Milwaukee River, Whitnall appreciated the natural surroundings of the country, in addition to the local politics of his city. In line with much of Milwaukee’s leadership at this time, Whitnall adopted a Socialist ideology in planning parks for the city. 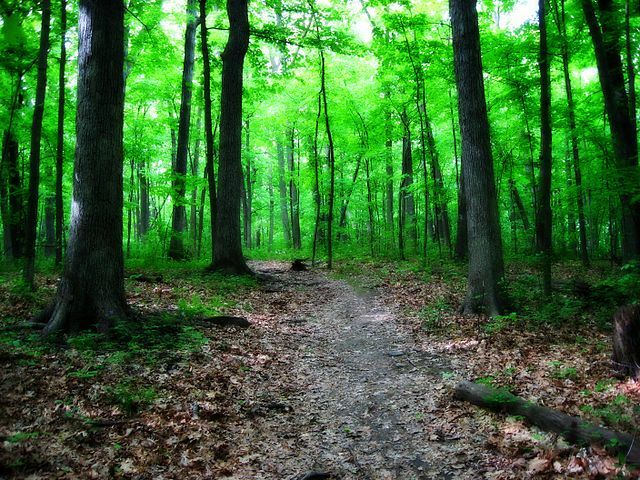 He felt that parks located along the County periphery—where unspoiled rivers, rolling hills, and pristine woodlands were found—were the best remedy for an urban existence that remained quite bleak. Whitnall blended his political desire to aid Milwaukee’s urban poor with an environmental drive to protect the regional wilds. The result was a comprehensive metropolitan park system located primarily at the edges of the County, connected by a series of parkways. Of note was Whitnall’s belief in the automobile (and the use of parkways) as a remedy for the congestion of urban Milwaukee. Today’s park system, largely a result of Whitnall’s Parkway Plan of 1923 remains largely intact. Of the nearly 15,000 acres of park space within Milwaukee County, the largest share is located along the outer edges of the County, serving largely suburban neighborhoods. Beyond the early beer gardens and parks such as Lake, a relatively small amount of park space remains in central Milwaukee to this day. Milwaukee’s parks are rooted within the historical, social, and political development of the city. Their placement, design, and relevance may be traced to the evolution of Milwaukee as an industrial city—a place where immigrants, breweries, and the desire to seek leisure led to a particular urban form. Milwaukee’s parks are a product of the economic conditions and landscape philosophies of earlier eras, but perhaps most importantly they are a product of the people who came here and built this city. ^ Christian Wahl, “Public Park System in the City,” in History of Milwaukee County from its First Settlement to the Year 1895, vol. 1, ed. H. Louis Conrad (Chicago and New York: American Biographical Publishing Co., 1895), 300-306. Kenny, Judith, and Lorne Platt, “Milwaukee’s ‘Gardens of the Poor’: Placing Urban Nature in the Liberal City, 1880-1905,” Wisconsin Geographer 24 (2012): 3-24. McCarthy, John. Making Milwaukee Mightier: Planning and the Politics of Growth, 1910-1960. Dekalb, IL: Northern Illinois University Press, 2009. Platt, Lorne. “Planning Ideology and Geographic Thought in the Early 20th Century: Charles Whitnall’s Progressive Era Park Designs for Socialist Milwaukee.” Journal of Urban History 36, no. 6 (2010): 771-791.